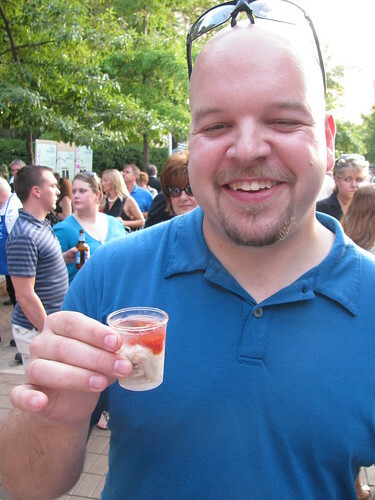 A few days ago I participated in a twitter contest hosted by local blogger Columbus Foodie. 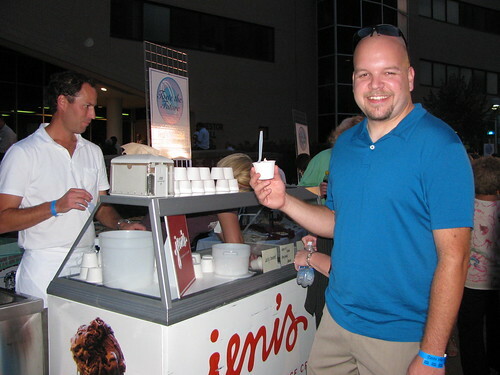 I won a pair of tickets to Taste the Future, Columbus State Community College (CSCC)'s fundraiser food tasting! We arrived at an inner plaza in the urban CSCC campus. I had no idea they had such a beautiful spacious commons. Our wrist bands came with five drink tickets. It is no surprise that we quickly made our way to a drink stand. The beer and wine selection was mediocre, but five drinks of even mediocre booze has merits. 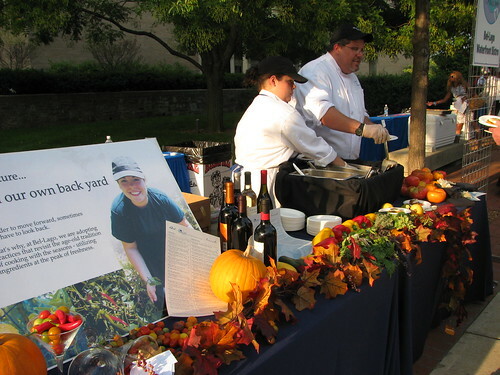 I always attend charity food events with a bit of hesitation. Will they have vegetarian friendly food? Is anything sourced locally? Are they doing anything to control waste? The answer in Taste of the Future's case is Yes, Yes, and Yes. Many vendors were happy to give me meat-free versions of their tasting bites. The grits at G. Michael's were amazing. Several tables had mushroom based appetizers, the Mitchell's Steakhouse having the best of those I tasted. (I verified with the chef later that the vegetarian appearing dish did contain the veal demi glace I tasted. Oh well, it was delicious.) I had a number of vegetarian soups and desserts. Quite a few restaurants featured local ingredients. Every time I saw this claim, I asked where exactly they sourced their produce. Local is a subjective word, after all. Several mentioned their Ohio tomatoes came from big distributors like Sysco and Roth. I am glad to see they are making attempts to include state-local producers. Bel Lago Bistro takes the cake for most local. Located on the Hoover Reservoir, the Bel Lago chef Jeff and his wife grow much of their restaurant's produce in an organic garden on restaurant property. Their entire table was decorated with homegrown produce and their feature dish, a caprese salad, included heirloom tomatoes and basil from their own garden. He also told us about a relationship with Westerville School's high school hydroponics class as a source of year round herbs. We will visit Bel Lago soon to check out their entire menu. Note: Their website projects, as so many restaurants do, a loud soundtrack. You have been warned. 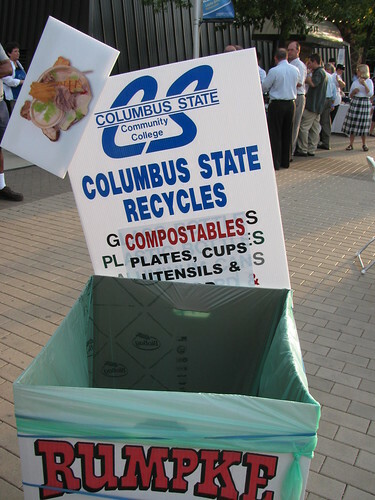 The CSCC commitment to waste-reduction throughout the event was well integrated and publicized. 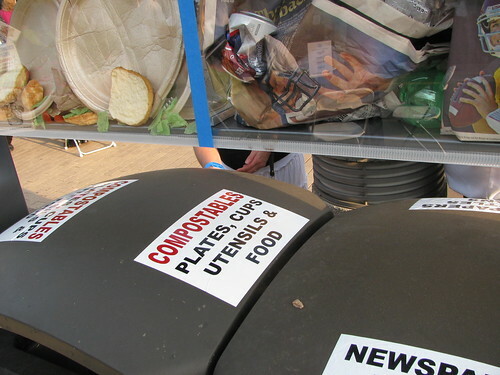 Nearly all the tableware (plates, utensils, and cups) was compostable and labeled trash cans directed patrons to separate compostable and recyclable trash. I even heard an announcement from the jazz stage directing people how to use these receptacles. Having been at other tasting events that involved a whole lotta styrofoam, I very much appreciate the footprint reducing efforts. 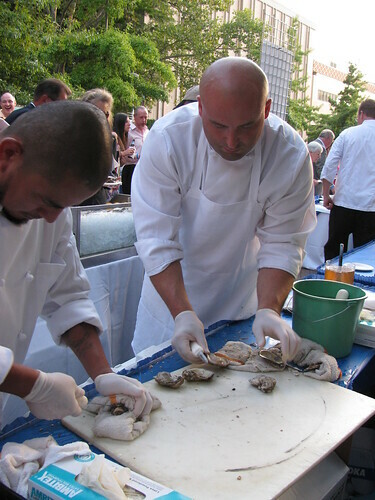 The Columbus Fish Market took a risk and brought raw oysters to Taste the Future. The Mid Western palate isn't always attuned to oysters, nor is warm weather conducive to keeping raw fish fresh. We talked to the chef and the oysters were as local as you can get here in Ohio - they were Connecticut Blue Point Oysters. Small batches were refrigerated indoors, brought out to a huge cooler full of ice, and hand shucked right before service. Alex, with his New England roots, enjoyed both the raw on the half shell oyster and a oyster/greygoose vodka/cocktail sauce shooter. Another top taste pick from the evening was Sage's crispy pork belly with jalapeno ketchup. I tried a bit of the ketchup and it was outstanding. I love a restaurant that not only makes outstanding a la minute sauces but also fine reductions. Unfortunately the pork belly dish was flying off the table so fast that I didn't get a good picture. I have been saying for years that Jeni's Ice Cream is the best ice cream in America. I was surprised at the number of people in line who clearly had not tasted her frozen goodness before. Beyond the superb taste, Jeni is passionate about using sustainably raised Ohio ingredients. Generous scoops of Sweet Corn with Black Raspberry and Berries and Burgundy were the perfect ending for our evening. Although the event was free for us, Alex and I agreed that Taste the Future would be worth the $100 per ticket. The atmosphere was fun, yet not crowded. We waited in only a few lines and there was plenty of space to sit and enjoy dishes when we wished. Thanks again, Columbus Foodie, for making our tasting possible.